Registration is open for Farm and Rural Lobby Day on Wednesday, Feb. 27 in Madison. The annual event is organized by Wisconsin Farmers Union. 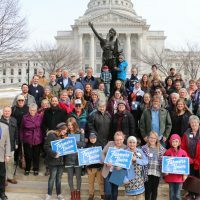 Farm and Rural Lobby Day will begin with a 10:30am registration and 11am issues briefings at Bethel Lutheran Church, 312 Wisconsin Ave., near the capitol square. Speakers will provide background information on pending legislation that is of interest to farmers and rural residents to help participants prepare for their meetings with legislators. Following lunch, the group will head to the Capitol to meet with their senators and representatives, with the day’s activities wrapping up around 4pm. There is no cost for Farmers Union members to participate. There is a small fee for nonmember participants. To register or inquire about carpooling routes, contact Camryn Billen at intern@wisconsinfarmersunion.com or 715-579-0145. Or register online at www.wisconsinfarmersunion.com/events. Please pre-register as soon as possible so legislative visits can be planned accordingly.